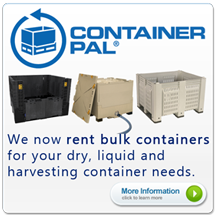 Buy Used Containers | Used Bulk Containers, Used Boxes, Used Pallet Containers and Used Shipping Crates. Reduce, Reuse & Recycle, right? Buying used bulk containers, plastic pallets and hand-held containers will reduce your material handling expenses by providing you with containers you need for your operation at a fraction of what you would pay for new. These pallets and containers often outlive their need for the initial project they were purchased for and can be reused over and over again for other applications. At the end of their usable life you can recycle your containers and pallets and even make back some of your money by selling them as scrap. “Why buy new” may be a better question. New 40x48 Nestable Plastic Pallet - "Seconds"